You’d be forgiven for not realising that Kieran Hebden had released a new Four Tet album, such was the low-key emergence of this new record. For Pink, self-released on digital-only formats - though a CD is promised for Japan in September - has no marketing push, no radio pluggers, no press people, no advertising, which means that it’s relying purely on word-of-mouth, and the strength of Hebden’s reputation. Luckily, that reputation is strong; he’s been one of the UK’s most consistent and creative electronic musicians for well over a decade now. Pink itself is, in some ways, less an album than a compendium anyway, stitching together his 12" singles from the last 18 months or so (plus two brand new tracks, which will be released on vinyl together shortly) rather than presenting a seamless whole of new material. With this knowledge it would be easy to think of Pink as lacking in gestalt, that sense of wholeness or cohesion that we’re so often looking for in albums, but actually the common origin of these tunes, as dancefloor-aimed tracks inspired by Hebden’s DJing over the last few years, binds them together just as much as any concept album theme ever could. The slightly crazed, drums-for-the-sake-of-drums that used to tumble through Four Tet tunes of yore have pretty much evaporated since the Ringer EP in 2008, and Hebden has since then been edging ever further away from the folk and jazz samples and instrumentation that used to decorate his work. This momentum has now swung almost entirely towards electronic textures and club beats, and in many ways Pink is the culmination of Hebden’s journey thus far, the logical next-step after 2010’s superlative There Is Love In You. The dancefloor suits Hebden; hearing him play some of these tracks during his set at last December’s Caribou-curated day of All Tomorrow’s Parties left me gagging for a whole album’s worth. Tracks are generally longer than you might be used to from Four Tet, sometimes left to pulse by themselves in a way Hebden hasn’t really explored before. 'Locked' opens the album with nothing but minimal, interlocking drum loops for well over a minute, before a characteristically beatific melody emerges, and spirals around those shuffling drums, phasing in and out of focus for a blissful eternity. 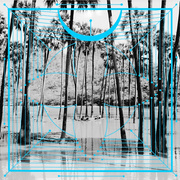 In 2012 the melody is electronic rather than acoustic in origin, but it still feels imbued with whatever it is that makes Four Tet Four Tet. Elsewhere, 'Jupiters' indulges in layered synthesiser twinkling which wanders into a weird, brief, but compelling marriage with a two-step rhythm, whilst 'Lion' playfully thumps and squeaks, a dark synth motif oozing underneath, incessantly sucking out melody, leaving the track feeling desiccated and vapid. '128 Harps' marries old and new, an almost parodic melody played on, of course, a harp, and underpinned by a garage beat and skipping vocal samples. 'Pyramid' is straight-up house like Akufen or Todd Edwards used to make, a driving beat and bassline steered by more diced and spliced vocal snatches. 'Peace For Earth' breaks the dancefloor hegemony and drifts into kosmische-y territory, far closer to Eno or Tangerine Dream than Daft Punk or Derrick May. It’s the centrepiece that the rest of the record hangs on, the glue that binds things together by throwing all this dancefloor enthusiasm into relief. The closer 'Pinnacles' is built from a sample of 'Noble Ego' by Buster Williams, a split-second transformed into 8 minutes of scintillatingly repetitive jazz-house, one of the best grooves Hebden has committed to tape (or, more prosaically, hard disc). Along with 'Ocoras', a delicious locked groove decorated with warm, time-travelling pads and concentric circles, it’s a highlight of the record. There’s a sense that Pink is somehow serious, utilitarian, workmanlike, that while the tracks brought together here may work in isolation and on dancefloors, they’re not as suited to indulgently solipsistic listening as previous Four Tet records. This is true, but it doesn’t mean that Pink isn’t also very good, and whilst it may not quite satisfy the sensual demands we’ve come to expect, it does a laudable job nonetheless. Hebden never stays still, and we, as his listeners, shouldn’t either, physically or aesthetically.